Giegling is more than a group of friends, is more than a project, is more than some ideas coming together. It was born in a classic student’s bar somewhere in Weimar, Germany. The right people in the right moment came together and just four parties were enough to mark the future of a what was label of the month some months ago on Resident Advisor. The story was written at Giegling bar in Weimar in the mid ’00s were Konstantin with a group of friends, most of them students in the University of Bauhaus were approached by the owner so the party started.. Crazy vibes of cool people, without lights and jazzy, punk atmosphere came together creating the absolute ambient. The bar closed but Konstantin, Rafael, Dustin and Vril did not want to abandon what was born there. They captured the feeling and they gave birth to the Giegling label. Their simple site, the whole atmosphere behind idea, the mysterious Prince of Denmark, the artworks and the overall aesthetics makes this label since its first steps just exciting with a stable evolution and great releases. Where elegancy can harmonically coexist with the underground. It is how we perceive as the essence of a proper rave. 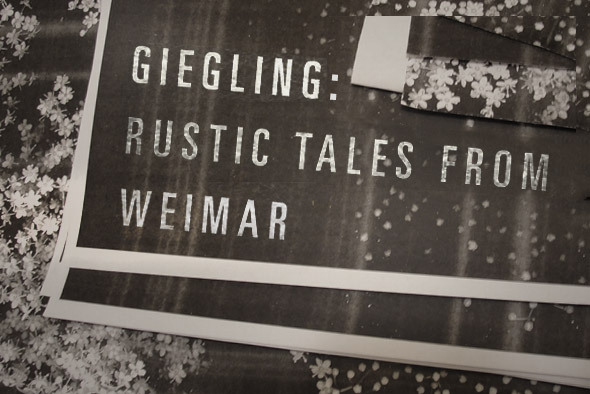 A fine taste of what Giegling is by Prince of Denmark with the track Traumwurm released on the EP Südstadt on 2013. Giegling has also a “child”, which is the label FORUM with two releases, one by Prince of Denmark and the LP Body and the other one by Vril, with the LP Torus, an album that stands out for us.